This page has links to historic air photos going back to the 1950s, recent photos taken for the Yellowstone River Conservation Districts Council, and our most current air photo collections of Montana. These are digital elevation model (DEM) and triangulated irregular network (TIN) data sets derived from LiDAR elevation point cloulds collected in 2004 and 2007. 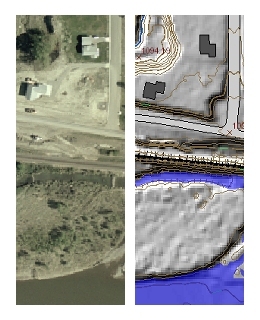 These data show locations of roads, streams, ponds, spot elevations, buildings, and other structures digitized from aerial photographs taken in 2004 and 2007, and elevation contour lines derived from the LiDAR data. This is a collection of 89 georegistered TIFF images of GLO township maps made between 1877 and 1906.